In each escape room you will uncover mysteries involving the secretive DeLaporte family and their hidden role in shaping the history of New Orleans. My group and I had a transportive, immersive, intriguing, and ultimately rewarding experience in the Mardi Gras Study. The decor and ambiance is beautiful and adds wonder to every step. The year is 1990, and Odette DeLaporte has invited you to her study. 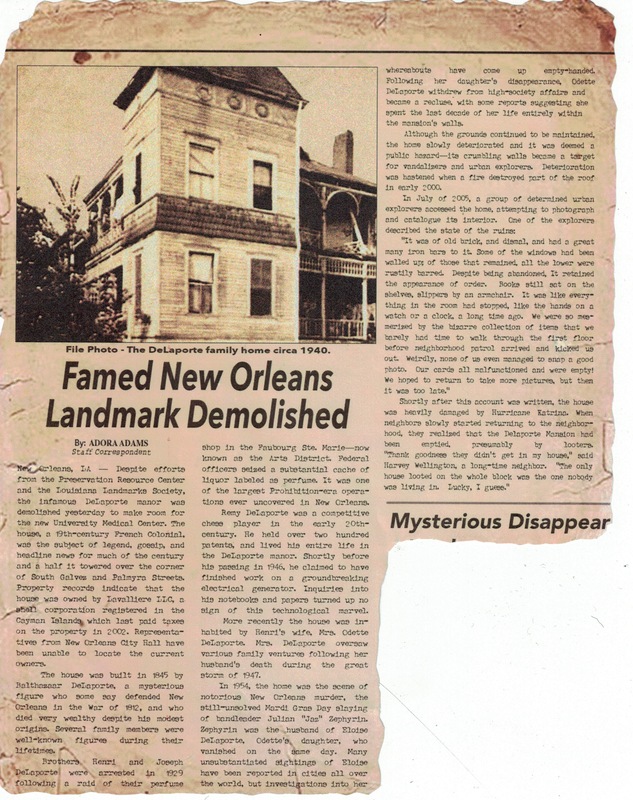 As the last remaining heir in New Orleans to the DeLaporte fortune, she needs your help locating a treasure which went missing a long time ago. The reclusive matriarch has not been seen in public for quite some time, yet she has agreed to meet with you with the hope that you can recover what’s been lost. Hi! I’m Dolphus Alonzo DeLaporte. I have done many escape rooms in multiple cities and the Jazz Parlor here was by far the best room we've ever seen. Travel back in time to the scene of a murder in the music parlor of the DeLaporte Mansion. Join forces with the police and grieving DeLaporte family members as they comb the crime scene for evidence. Can the two groups cooperate long enough to solve this 60-year-old crime, or will the answers be lost forever? Fantastic room! I've played over one hundred escape games and I had a great time in the Inventor's Attic. Wonderful story, atmosphere, sound effects. Play it! A storm is rolling in, and the DeLaporte’s annual carnival ball is supposed to start in an hour. Problem is, all the lights in the house are on the fritz. All wires in the grand estate mysteriously lead to the recently discovered attic bedroom of Uncle Remy DeLaporte, a kooky inventor who once claimed to have invented a perpetual motion machine. Can you restore the power before the ball starts? The DeLaporte Family coffers have run dry and the city is threatening to put the house up for a tax sale. You are called to investigate the dark and cramped wine cellar, as it was rumored that Silver Dollar Sam and his band of rum runners once used it as a storehouse. Can you find enough loot to help save the DeLaporte home, or will you be stuck forever by one of the many booby traps? Note: All guests will be in complete darkness for up to 30 minutes of gameplay. Crawling for a short distance is required. Every Smugglers Den room is private. Please book all tickets for your group in one transaction. The timeslot will close after a completed purchase. For ages 16 and up. You’ll have a great time regardless of the room you choose. There is a story which connects all of our escape rooms, but they don’t need to be played in order to understand it. Can you find Mrs. DeLaporte's long lost treasure before time runs out? Can you solve the murder and prove a family member's innocence? A storm is approaching. Can you turn the power back on before the midnight ball? Can you escape the smuggler’s den before you get trapped forever? Travel through history to help the DeLaporte Family.